Christian: Well, I made it through Thanksgiving without eating every thing in sight. This may be the first year I didn’t consume an entire Swiss colony Beef Log and a wheel-o-cheese. There’s always Christmas. Aaron: Three Thanksgiving meals in twenty-four hours, plus a smoked rack of ribs and tenderloin for my kid’s birthday on Saturday. Did I eat as much as usual? Maybe. I don’t know. And when it’s covered in gravy and/or my homemade barbeque sauce, I really don’t care. Win of the week: I didn’t consume a whole turkey on my own.That’s not something normal people brag about. Win of the week: Ribs–covered in homemade rub and smothered in homemade sauce. Only had two out of the entire rack. Fail of the week: It’s Thanksgiving and I have 4 days of catching up to do. 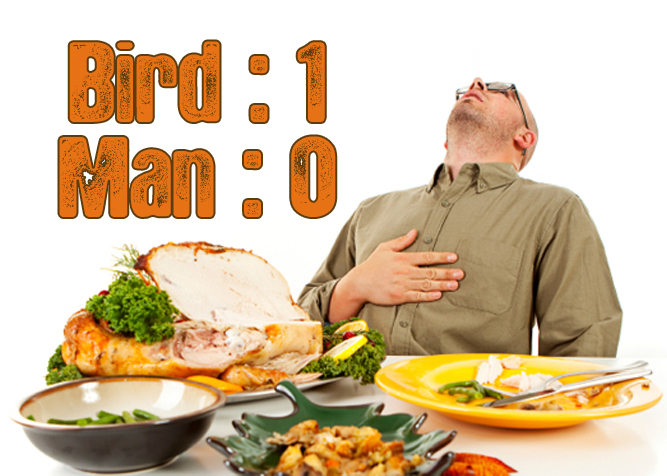 Fail of the week: One cannot do Thanksgiving correctly while simultaneously doing Fatoberfest correctly. I proved that point. Mood/Thoughts: I’ve lost less than a pound a week since we started. This is really a failure across the board. I have a legit/serious issue that keeps me from doing cardio right now, but I still feel like a l0ser. Mood/Thoughts: Christian needs to stop whining. You’re dropping it the right way… and I seem to be picking it up. I’ve got a race in March that I started training for yesterday, so I’m doing my best to amp things up. This crap is hard. I’d rather just sit on the couch and eat something. Preheat broiler. Sprinkle fish with 1/4 teaspoon of the chili powder and 1/4 teaspoon salt. For chili-lime cream, in bowl squeeze 2 teaspoons juice from half the lime. Stir in sour cream, garlic powder, and remaining chili powder; set aside. Cut remaining lime half in wedges for serving. Place fish on unheated greased broiler rack; tuck under thin edges. Place shells on baking sheet on lowest rack. Broil fish 4 inches from heat 4 to 6 minutes per 1/2-inch thickness, until fish flakes with fork. Break in chunks. Serve tostadas with cabbage, chili-lime cream, avocado, tomatoes, lime, and pepper sauce. Serves 4.